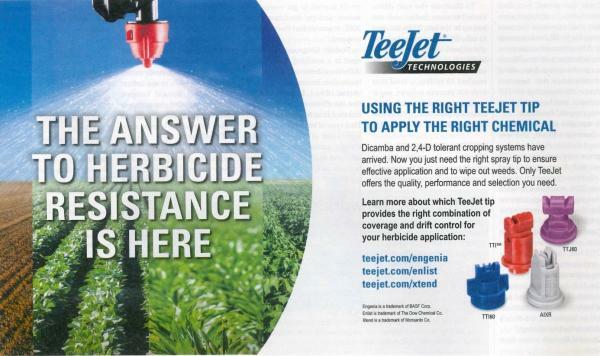 Since I inducted the FeXapan advertisement into the Herbicide Ad Hall of Shame for proclaiming to be the answer to resistance, I feel obligated to do the same with TeeJet's recent ad in Wallaces Farmer. Proper nozzle selection is critical for: 1) minimizing off target movement of the new dicamba and 2,4-D products, and 2) following the restrictions on the new labels. However, the type of nozzle used is not going to have any impact on resistance selection (assuming the nozzle provides good coverage of the target). I have no idea why anyone would think a nozzle is the answer to herbicide resistance. At times it feels like the industry is moving forward in providing a uniform message regarding resistance management, but then the marketers take control and set back the efforts of so many.